On December 7, a large-scale tourism promotion conference organized by the Sanya Tourism Development Committee was held in Kaohsiung, Taiwan. 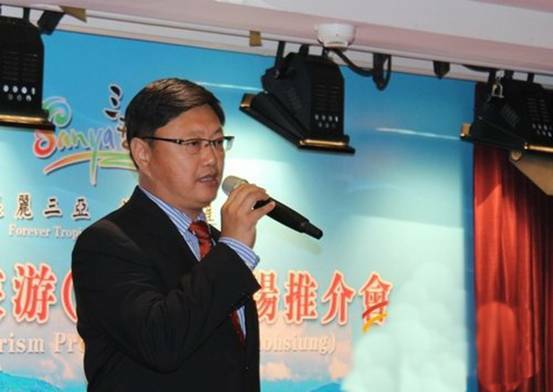 More than 70 representatives from the Sanya Government, Sanya Travel Agents Association, Taiwan Travel Agents Association and Kaohsiung Association of Travel Agents attended the event. In order to give Kaohsiung tourists an accurate picture of the tropical island, the Sanya delegation gave a general introduction of Sanya tourism resources and displayed the promotional film of Sanya that showed Kaohsiung tourists the beautiful and varied scenery in Sanya. In addition to that, two tourism-related enterprises including Guoxi Hotel offered special promotions. According to Shen Benli, the Director of Kaohsiung Association of Travel Agents, more than 20,000 Taiwanese tourists have visited Hainan Island since the Far Eastern Air Transport launched flights between Kaohsiung and Haikou this January.